How would you like to be the most popular bride? Here is how to start; let your bridesmaid choose their dress. Your girls will be thrilled at the thought of not shoving their bodies into a style that doesn’t suit them, for a body type that was never actually considered. Do you want the responsibility of your girls feeling awful about how they look on your big day? I know what you’re thinking, what if they choose something awful? Here is a step by step guide to sanity to help you let go of the wedding reins and trust the women who you chose to be at your side. Give some parameters. If you have a particular color in mind, provide them with a sample. Your version of aqua might end up to be teal on your wedding day. If they are all in different cities and towns email them distinct styles, you like. Example: extended to the floor. Short to the knee. Middle length below the knee. Fabric. Maybe it doesn’t matter to you. If it does, again, be specific. Taffeta, silk, cotton, and lace details of some sort. Long sleeve or short? Some dress shops and bridal designers offer a variety of styles available in a palette of colors. 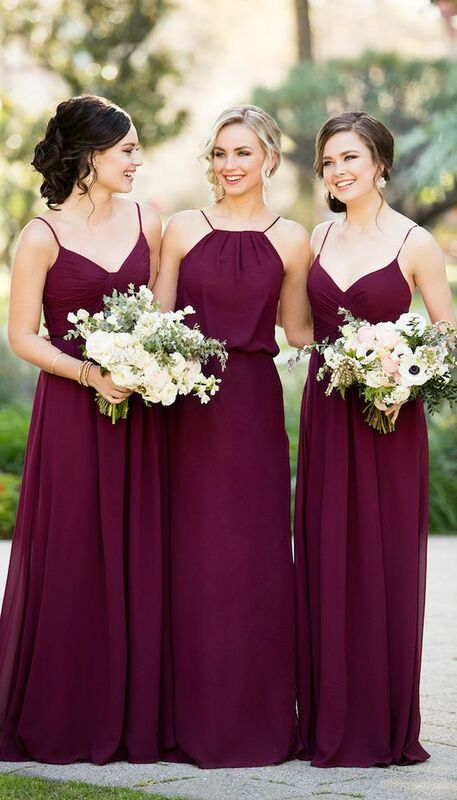 You can choose a few specific styles — and pre-designate the exact color — and then let each bridesmaid choose what is most flattering on her. Just because you are not picking it out doesn’t mean you don’t get to have some input. You can also request the girls to either email or text you a photo of them in the dress or an image if they are ordering online. Be specific about what kind of shoes you'd like your bridesmaids to wear with their dress selections, especially if their feet will be visible. One bridesmaid in flat sandals standing next to another in platform stilettos with ankle straps just looks weird. Remember, exercising your God given bride power over your bridesmaids certainly will cause hard feelings in the long run. Your girls are all shapes and sizes and have all different budgets. A $200 dress might be a walk in the park for one girl, but could be a means to a panic attack for the other. Be considerate. They are going to be supporting you, partying with you, spending hours making wedding favors and burning their fingers on hot glue guns for you.